ArchDaily: How to Save Suburbia? I’ve written a lot on this blog and in my City Talk columns in the Savannah Morning News about changing demographics, about traffic and transit in the days of high gas prices, about the crucial need for adequate population density for cities to thrive, about the long-lasting impacts of the bursting of the housing bubble, and any number of related issues. Herein lies the great complication of suburbia. Its myth – of wealth, whiteness, a steady-job in the big city, and a space to call your own – keeps getting in the way of the big-picture: the thousands in need of change. If architects are to “save” the suburbs, and redesign them based on their multiple realities, they’ll have to start by separating themselves from the myth. By bursting the ‘burbs’s bubble. As Quirk’s piece notes, for those with the money and the time and the mobility, suburban life can perfectly match some Americans’ choices. But America’s suburbs now have more people in poverty than America’s cities do, and the lack of transit options, high gas prices, low home values and an increasing number of rentals, and other factors are leading to a steady degradation of life in some formerly pristine suburban areas. Part 2 gives an overview of design challenges and solutions. We can’t just abandon the suburbs, and it’s senseless to lecture residents about abandoning their cars when their entire neighborhoods have been designed for auto dependence. As architects, we are in the tricky position of making redevelopment and density, necessary from both a moral and environmental standpoint, palatable to the community. Which means we have to design with three major points in mind: making the ‘burbs (1) safer for its children, (2) more profitable, and (3) kinder to the earth. The key will likely lie in rethinking how suburban communities work. That means reorienting ourselves to the idea of nodes and hubs — specific areas that can become mini-downtowns with a mix of uses and accessibility via alternate means of transportation. Those goals have clear implications for street design (more intersections, shorter blocks, complete streets) and for zoning (mixed use areas with relatively high density and a high percentage of lot coverage) as we try to create anchors for the less dense, single-use neighborhoods nearby. The area around Armstrong Atlantic State University on Savannah’s Southside would benefit by this kind of rethinking, as would any number of areas in the Savannah metro area. Of course, Savannah’s problems pale beside the suburban sprawl that might prove to be literally unsustainable outside many of America’s major cities. Quirk does not really discuss what to do either for the short or long term about new suburban developments that are at a standstill with little prospect of success. 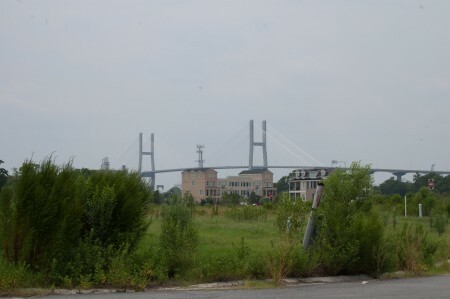 I have a picture here of the Reserve at Savannah Harbor, which has just a few residents and acres of vacant lots, but the Savannah area is dotted with similar scenes.